Salt cedar looks fluffy and pink but is really an invasive species. 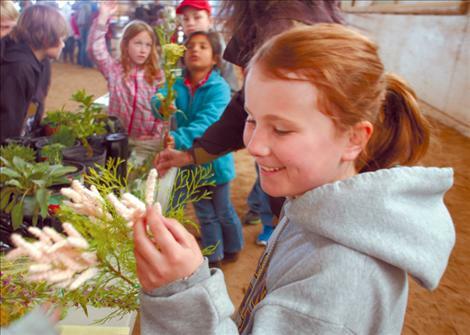 During Ag Days fourth graders checked out noxious weeds and invasive species brought by Rene Kittle, MSU CSKT Extension agent. 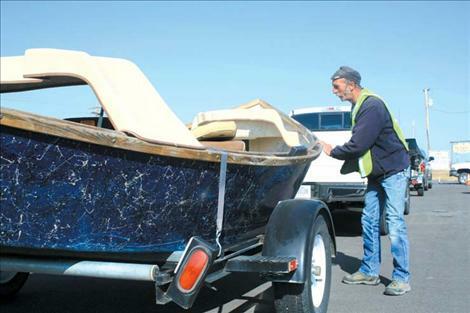 Johnny Eggebrecht inspects a boat at the Ronan checkpoint on U.S. Highway 93 before it heads to Flathead Lake. Rows of flowering rush extend into Flathead Lake. This photo was taken in 2009 as part of an aquatic weeds training program put on by the extension office. 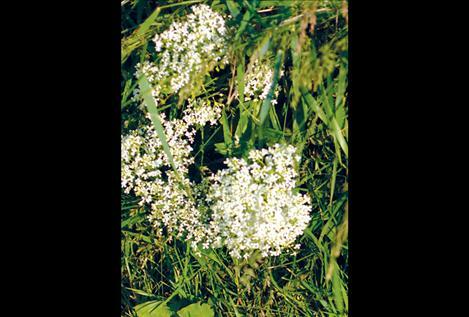 White top is one of several invasive weeds present on the Flathead Reservation. Flowering rush is one of several invasive weeds in the Mission Valley. Invasive species can be flora, fauna, or microorganisms. They range in size from a single-celled microorganism to a massive golden willow tree. Their populations vary from one to millions upon millions of individual organisms, but they all have one thing in common: they do not belong here, and they are causing many, many problems. Despite the best efforts of land managers and conservationists, non-native species in the Mission Valley continue to grow. Far from a new problem, National Bison Range wildlife biologist Amy Lisk said the range has documented records of St. John's wort, a non-native species of weed, dating back to the range’s creation in 1908. Non-native organisms are problems for many reasons. First, they become a new competitor for established species. Second, they are often better competitors for food and water, carving out their stake in the landscape by out-competing and killing off native plants and animals. Third, they pose a risk to agriculture, ranching and human recreation. Shockingly, every land manager interviewed for this article believes that once a species is established, they are here to stay. The time and money required to rid the landscape of these invaders simply does not exist. “When you talk about Lake County and Knap Weed, eradication shouldn’t even be in the vocabulary. It isn’t attainable, in my opinion,” said county weed director Tom Benson. While it may not be attainable, efforts are under way to educate the public on the dangers of invasive species, stop the spread of established species and curtail new invaders. Land managers and conservationists haven’t given up; far from it, actually. Confederated Salish and Kootenai Tribes wildlife biologist Janene Lichtenberg said bullfrogs were likely introduced to the Mission Valley in the early 1970s. “I’ve never had any confirmation, but the story goes that there was an individual who was trying to farm them and sell the legs to restaurants as food,” Lichtenberg said. Currently, there is a heavy concentration of bullfrogs between Dixon and Perma on the Flathead River. Lichtenberg said in recent years, they’ve spread to Sloan’s Bridge and the Little Bitterroot River. They are slowly moving up that drainage and moving up from where Camas Creek enters the river. There is also a population in Hot Springs. To put the bullfrog infestation into context, a comparison might be made to the Bitterroot Valley south of Missoula. “(Bullfrogs) have virtually wiped out native amphibians from the lower Bitterroot Valley ponds and wetlands. The native amphibian species have disappeared in recent years,” Lichtenburg said. They can carry diseases that don’t affect them, but do affect native amphibians. They have few to no natural predators and can live into their teen years. Lichtenburg has a live female bullfrog for education purposes. Her frog is at least 13 years old. As a female, she can lay 20,000 eggs per year. Native leopard frogs only lay 1,500 to 3,000 eggs per year. Lichtenburg said she is concerned for a repeat of the lower Bitterroot Valley here on the Flathead Reservation. Native to the western US and Canada, attempts elsewhere to cull bullfrog river populations have been unsuccessful. CSKT Forest Development Program Manager John Matt said much of his work deals with getting rid of invasive tree species. Trees like Russian olive, golden willow and salt cedar wreak havoc on ecosystems based on the amount of water they are capable of consuming every day. According to Benson, salt cedar trees can consume 500 gallons of water per day under the right conditions. Matt said these trees were intentionally planted around Pablo Reservoir and Ninepipe Reservoir to dry up wetlands so they could be farmed in the early 1900s. The problem is not as extensive in the Mission Valley as it is in other parts of the state. Benson said other counties will come onto a landowner’s property and cut these trees down with or without the owner’s permission. “I try not to be that heavy-handed ... but they will literally dry up cattle water sources if there’s enough of them,” Benson said. Even so, the prospect of eradication is not a cut-and-dried solution. Pablo Reservoir is so full of Russian olive trees that nearly all tree vegetation is non-native. Cutting down every last Russian plive would mean destroying habitats for native species like owls and other birds and insects. Mack Days on Flathead Lake represents a new way of thinking about conservation. The twice-yearly fishing tournament, aimed at reducing invasive lake trout populations in Flathead Lake, is one of the first attempts by conservation agencies to reduce invasive species by involving anglers. One reason, Hansen said, is that the expense and manpower required to remove lake trout from Flathead Lake entirely would be massive. The CSKT is currently writing an environmental impact statement to explore other tools of reduction. These include bounties, commercial fishing and netting. Bull trout and cutthroat trout populations have not increased since Mack Days began, “And we wouldn’t expect them to,” Hansen said. The small harvest offered by Mack Days is not enough to affect short-term populations. However, Hansen said it will gradually help over a longer period of time. In addition to lake trout, Flathead Lake is under threat from other aquatic organisms. 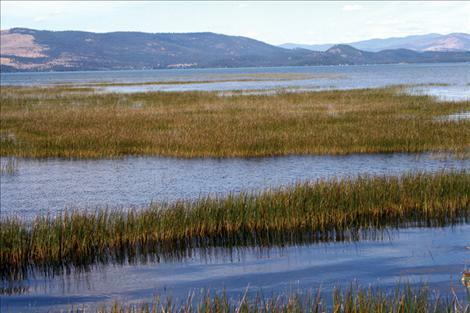 The research conducted over the past decade has found that 10-percent of Flathead Lake is well suited for flowering rush, especially in shallow areas. There is about 700 acres in the south end of the lake near Easy Bay and the equivalent amount on the north shore. “Right now, we’re starting a study to evaluate the impacts of flowering rush and the relationship to invasive fish,” Dupuis said. So far, the research has found that flowering rush makes a good habitat for small mouth bass, perch and northern pike. By association, it creates a good food source for the invasive lake trout that prey on these smaller fish. Dupuis did not have data regarding how the non-native aquatic weed would affect bull and cutthroat trout. “The most significant comments we get about it are from lakeshore property owners because it will choke out your beach front,” Dupuis said. 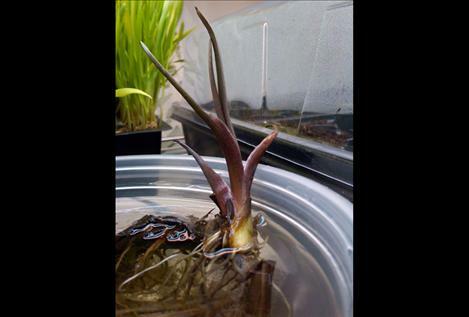 Aquatic snails gravitate towards the plant because it collects algae, a food source for the snails. These snails are an alternative host for swimmer’s itch — a parasite that burrows into the human host’s skin as water dries, causing itchiness. While not much more than an irritant for humans, it can be a serious affliction for waterfowl and small animals. Researchers have mapped flowering rush as far south as Perma. Curly leaf pond weed is also present in the lake, though more prevalent in the northern end. “It’s probably down here; we just haven’t found it yet,” Dupuis said. “We know what to do; we know the impacts it has; but no one has yet pulled the trigger,” Benson said. In an effort to keep more non-native species from entering the lake, FWP began a program in 2007 that stops all boats heading toward Flathead Lake and checks them for pieces of invasive plant matter, snails and mussels, which haven’t spread to Flathead Lake yet. In many cases, a tiny piece of stem or root from one of these plants is enough for a clone to grow. Human transportation by boats and boat trailers from lake to lake may be a major means of reproduction. The program, based in Helena, has 14 stops in Montana. Johnny Eggebrecht has worked for FWP from mid-May through mid-October over the past several years. His job is to check every boat headed north on U.S. Highway 93 towards Flathead Lake for invasive species. In the summer, on a weekend, Eggebrecht and coworker Chuck Seeley will check 140 boats every day. This time of year, they will only check 10 to 20. Even so, the checkpoint just south of Ronan only sees 40 to 50 percent of the boats on Flathead Lake. The rest take alternate routes and are not checked for invasive species before they are put into the lake. 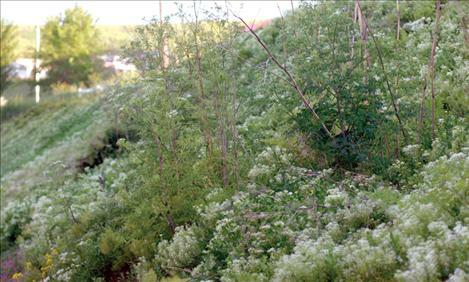 Regardless of who they work for, every wildlife biologist and land manager interviewed for this article mentioned invasive weeds as a growing concern in the valley. Many species are known to exist, and new species show up every year. Established species include St. Johnswort, white top and knap weed. According to every wildlife biologist and land manager, they out-perform, out-multiply, and out-compete every native species. Several governing bodies spray, pull and burn the weeds in an effort to destroy them, but, again, there is simply not enough money or manpower to kill it all. Many of these weeds were brought to the area in bags of seed transported from other areas at the turn of the last century. Some were planted for decoration around homes, but lately it seems that these seeds are more readily transported by unknowing or accidental human means. “I’ve been in the valley my entire life, but white top used to be primarily in Mission and Charlo. Now it’s throughout the entire county. A lot of that has to do with the amount of hay being sold from south county to north county,” Benson said. Benson called this a perfect example of forces beyond the control of traditional land management. Beyond the prospect of trade and business spreading weeds and their seeds around the valley, new invaders are often transported by heavy equipment and machinery used in fighting wildfires. Matt said that while fighting the West Garceau fire, he noticed hundreds of acres of knap weed surrounding the fire. Equipment and firefighters brought into the area from Idaho to help fight the fire was sterilized prior to use in the field, but even after sterilization to ensure new weeds do not enter the area, these trucks carried acres of knap weed from place to place. Workers also dug into the soil while cutting fire lines. This effectively tilled the soil and prepared it for next year’s knap weed growth. On one occasion, Matt had to drive 14 miles over ground to another problem area. “Fourteen miles — I could have spread millions of seeds with one truck in one day. Imagine what all the other water tenders might have done,” Matt said. Further complicating the problem, land managers and wildlife biologists must take into consideration the opinions, views, goals and wishes of other governing bodies in the valley. These include the CSKT, Lake County, city governments, Montana Fish, Wildlife and Parks, the federal government and private landowners. Environmental change must also be taken into account so as to plan for future efforts. “The environment has changed so much — whether you believe in global warming or not, the rainfall and temperature needs to be taken into consideration,” Benson said. Presently, no organization, website, laws or documents exist that unify all land management agency efforts in the Mission Valley against non-native species. All parties expressed a willingness to participate in such an undertaking. Faced with the task of protecting wildlife into the foreseeable future, many wildlife biologists and land managers face an incredible uphill battle. With this in mind, the tribes are designing a website with a smartphone application so citizens can take pictures of new species, document the exact location, and upload images to the Web. Many conservationists hope this will become a jumping-off point that will lead to more inter-agency cooperation and data available to land managers and biologists. In addition, Lisk said the CSKT, Lake County, Sanders County, Missoula County, National Bison Range and the U.S. Fish and Wildlife Service and a few special interest groups like Ducks Unlimited and Pheasants Forever have begun to meet informally and discuss uniting conservation efforts through a more coordinated treatment plan. Facing a nearly impossible task, each biologist and land manager acknowledged the difficult road ahead. Even so, every single one of them is planning for the future and working toward a common goal despite the growing cause for concern.